I love my slow cooker. I know it isn’t the best way to cook things, but it is really convenient. I found this recipe in my Cooking Light last year, and have made it several times. The kids seem to really enjoy it as well, which is a bonus. I leave out the spicy component so they will eat it and Paul & I spice ours after it is cooked. I usually make this exactly as is seen here, but this time I took some shortcuts to make things go a little quicker. Both are delicious and easy. Heat up a large saute pan on high with high sides. Swirl in olive oil and add in trimmed pork shoulder to brown on every side. This should take about 6 – 8 minutes. While the meat is browning, add chicken broth, orange juice, cilantro, orange and 3/4 tsp salt & 3/4 tsp pepper to a blender and blend well. 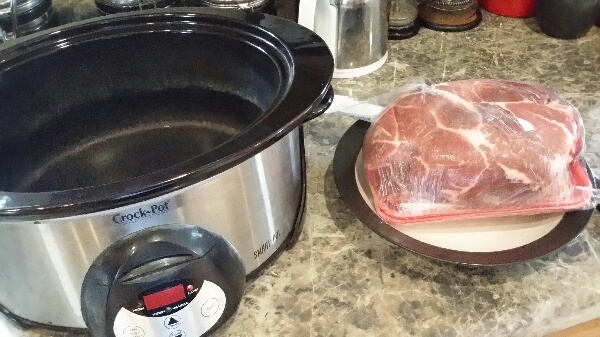 Once meat is done browning, add into the slow cooker. 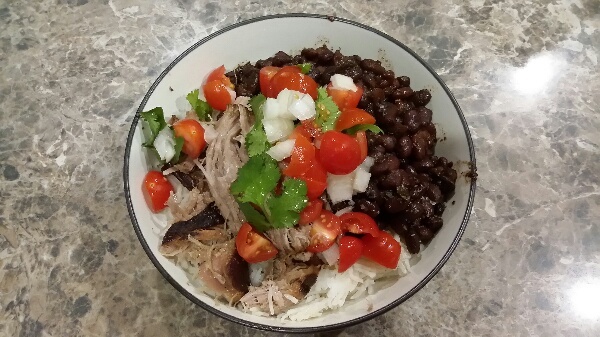 Pour uncooked dried black beans around meat. (Check to make sure the black beans don’t have any rocks or pebbles in them. I tend to find one per bag.) Saute chopped onions and garlic for 1 minutes in the used pan. Add in oregano, paprika, cumin and bayleaf and let cook for 1 minute. Pour the orange juice mixture through a sieve into the pan. Throw away solids. Let cook until it all comes to a boil. 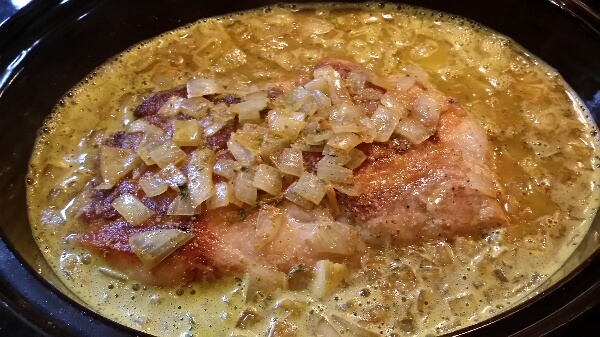 Pour liquid over pork shoulder and cover the slow cooker. Cook on low for 8 hours. Before serving, chop tomatoes, onion and cilantro and sprinkle with kosher salt. 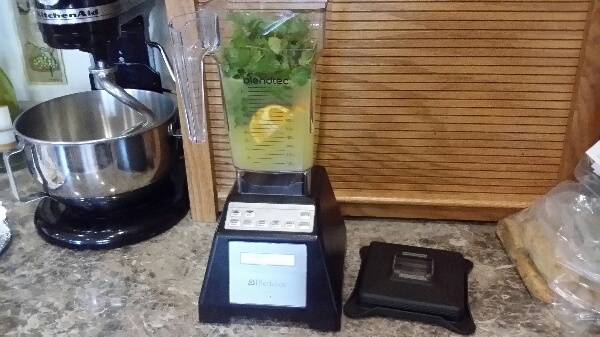 This will be your garnish.